Q. Where Did the Zucchini go to have few drinks ? What is so special about this Zucchini ? Zucchini (courgette) have high water content about 95% water, which makes them one of the lowest calorie vegetables. Zucchini is good source of vitamins A and C, as well as potassium and folate. One-cup raw sliced zucchini contains less than 20 calories and provides 28 mcg of folate about 7%of adult Recommended Dietary Allowance (RDA), 12 mg of vitamin C and 250 mg of potassium. Though Zucchini is not as high in beta-carotene as winter Squash it is still a considerable source of this very important antioxidant. According to the American Cancer Society, foods rich in beta-carotene may lower thee risk of cancers of the larynx, esophagus and lungs. There is no similar benefit from beta-carotene supplements. The beta-carotene is lost, if the skin is discarded. Thus, when preparing zucchini do not peel, but include the skin, where the majority of the nutrients are retained. There are many varieties of zucchini, ranging in color from bright yellow to dark green. While buying zucchini choose dark green slender with pale yellow or white stripping. Choose smaller (therefore more tender) ones, the best zucchini are 4 to 9 inches long. 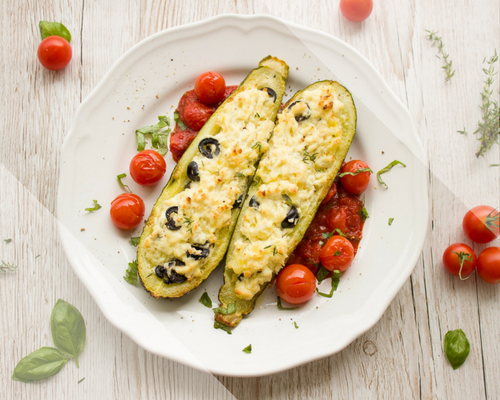 Beauty of using zucchini is its unobtrusive flavor, which complements other ingredients in variety of dishes. Raw zucchini is a pleasant to a vegetable platter or salad and dieters can sometimes keep bags of sliced zucchini in the refrigerator for easy snacking. It can be used in soup. They are delicious when grated and added into cakes, other baked goods.